Have you ever read Thomas Pynchon and thought, “Man. This would be pretty awesome stuff if I could even begin to grasp what on earth he’s talking about”? 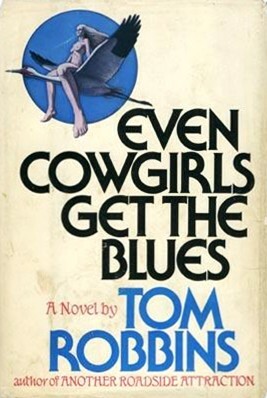 If so, Tom Robbins’ Even Cowgirls Get the Blues may be for you. For all its postmodern whimsy, it’s an actual book with an actual, accessible plot. It’s charming when it’s not being absolutely ridiculous. But then again, ridiculousness is part of its charm to some, I’ll wager. Sissy, our protagonist, has huge thumbs. I’m not sure if there’s a figurative meaning for that, but if there is, I don’t mean it figuratively. I mean the thumbs on her hand are huge. She hitchhikes with them. She has a lot of thoughts. The author also has a lot of thoughts. Sissy’s travels take her to an all-girl ranch, run by Bonanza Jellybean, that is nearly utopia. Everything in the novel hinges on this place. Even when Sissy leaves shortly after arriving, her heart stays there. Interesting miscellany ensues. Endangered birds are fed peyote. There is folklore around something called the clockworks, which is difficult to describe, especially since I don’t understand it. A pervy old would-be philosopher on a hill spouts cryptic tidbits of what’s either spiritual knowledge or nonsense. The author interjects himself for a chapter and then scolds himself for interrupting the story. But it all winds up coming to this: when the world conspires to take the all-girl ranch from the posse, they fight for it. I won’t spoil the ending from there. Robbins is creative writing at its most creative, and his writing style is postmodern (or “po-mo,” if you’re an insufferable M.F.A. candidate) as can be. The content is a different story–Robbins takes himself quite seriously in many cases. But as far as style goes, he is just as I said before–an accessible Pynchon. He manages to weave an actual, interesting, followable plot in the midst of his zaniness. Ah, but here’s the gripe. Normally when I find characters to be the fault of a novel, it’s because they’re trite, cliche, or otherwise unremarkable. Here, they’re all remarkable. That’s because they’re all the author. It didn’t start out that way. Sissy was unique in the beginning. The Countess is fantastically unique (at least before he gets his marbles rattled). And Bonanza Jellybean, bless her literary figure’s heart, remains unique until the end. But almost all the rest of the characters–Sissy, Dr. Robbins, the Chink (that’s his name, for real)–they all become one voice. One philosophical, cooky, offbeat voice, but one voice nonetheless. It’s like reading an Ayn Rand book. You get the feeling that all characters are just vehicles for the author to speak, as himself. Some of the girls at the ranch are different from the author. But they aren’t unique. They are archetypes representing different schools of feminism, with Delores Del Ruby being the radical separatist and Debbie being the cultural feminist. And frankly, they turn into the author at the end, too. But, oh, my Jellybean. In all her simplicity, she is separate from the author and free of roles. All she wants, and all she’s ever wanted, is to be a cowgirl. And her belief that all people should be able to be whatever they were meant to be, that pure simplicity, makes her the most endearing. But before I leave the characters section, one note. It’s interesting that who I can only assume is meant to be the villain of the novel, the feminine hygiene magistrate Countess, is one of the best characters in the book. Robbins, who to his credit has written a fantastically girl-centered, girl-empowered, feel-good book, clearly does not identify with the one in his book characterized by his hatred of women. So he separates his voice out from the character and just writes an awesome, funny, unusual, despicable character with prissy tastes and raunchy but to-the-point conversation. My thoughts? Robbins, over the course of writing the book, fell too in love with some of his characters. He and his characters all started to meld together until no one was distinguishable. Also, enjoy your time at the ranch, readers. It’s a great place to be. The scenes at the ranch are the best parts of the book, and you will feel as hollow as Sissy did when you have to leave. I should mention, too–the fun of this book is a highlight. It’s serious at times, but for the most part, it’s an enjoyable, light pleasure cruise of a read without being mindless. It’s like watching a coloring book be filled in with a crazy genius holding the crayons. You have to like the off-color and some raunch to enjoy this book. You also have to have a special love of language for its own sake, I think. There are a lot of meandering chapters. But for the most part, this is a really delightful book, and its accessibility is appreciated, considering the genre. I had a good time reading this. It put a smile on my face. But it wasn’t all sunshine for me as a reader. You got the first glimpse into my issue when I discussed the characters. And you may recall that I said the style was postmodern, but the content was not. That’s because the content wasn’t flippant about reason and purpose and deep thought–in fact, it was all up in those things. And that’s the exhausting part, for me. The philosophizing and deep-for-the-sake-of-deep was tiresome, and the characters just wound up being the mouthpiece for the author’s ideas in the end. It’s a little hard to take. Sissy’s thumbs, for instance–you got the feeling there was supposed to be symbolism in there about her being especially evolved (you know, opposable thumb times ten or something), but you also got the feeling it was never really fleshed out in the author’s head. He was just going to throw it out there, and people who got him would get it. Okay, that’s fine. But it’s not exactly brilliant writing. And there’s more. There’s a huge spiel about how everything in nature is a circle and there’s all the philosophy about time and clocks, and frankly, none of it feels like it was well thought out. It really is like reading Ayn Rand sometimes. “I’m a philosopher! I have big thoughts! Check out these vague and undeveloped big thoughts!” When conversation after conversation goes on like this in the book, I kind of wanted to skip ahead. But those are harsh words for a book that I enjoyed a lot. I won’t say I’ve never read anything like it, but many readers probably haven’t, and I don’t think I’ve read anything in the genre that was this fun. This is a great avant garde starter book. This entry was posted in Lit--General, Lit--Overviews and tagged Even Cowgirls Get the Blues, Tom Robbins. Bookmark the permalink. Everyone should capitalize my name. What a delight to hear from you, sir. Yes. You need a Kindle. Or the more affordable book light. It is so okay for you to love Cowgirls. So very okay. You can also subscribe to @DailyRobbins on Twitter for a endless stream of delightful Robbins brain snippets. Fun for the whole family, provided your family is full of adults.